Save to Pinterest for Later! The Hoh Rainforest gets at least 12 feet of rain a year and is a unique temperate rainforest with a fascinating ecosystem. Besides the giant old growth trees (generally more than 300 years old! ), numerous mosses, fungi and understory plants, it is also a place of incredible wilderness. If you get away from the parking lot, the only sounds you’ll hear are the rush of the river, the singing of many birds and the wind moving through the forest. The Hoh is home to the One Square inch of Silence and has attained legendary status throughout the world. 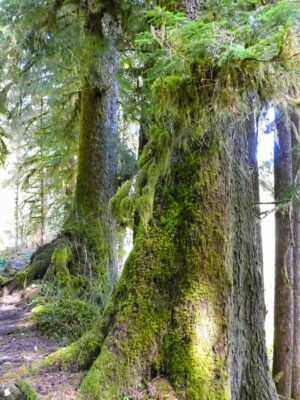 For ideas for other places to see Old Growth forest closer to and even in Seattle, check out this previous post. Getting to the Hoh is a long drive from anywhere! You will definitely need a car to get there. It’s a solid four hour drive from Seattle, 3.5 hours from Tacoma and five hours from Portland. If you were really determined, and didn’t mind a very long day in the car and didn’t want to see anything else, you could get there in a very long day trip from Seattle, Tacoma or Portland. I really can’t recommend doing that however, since the Hoh is a place that needs to be enjoyed at a leisurely pace. 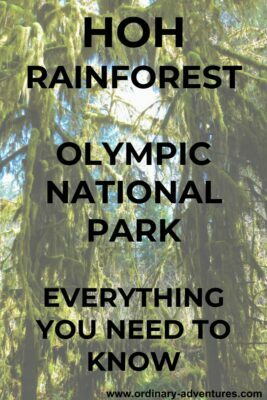 In addition, there are so many other amazing places to see in Olympic National Park, don’t miss out by not seeing some of the other highlights (see my suggested itinerary here). I recommend making it a loop, driving through Olympia and around Lake Crescent and Kalaloch Beach to the Hoh and then returning through Forks, Port Angeles and taking the ferry back to Seattle (or you can take the Tacoma Narrows bridge if you’re returning to Tacoma or Portland). This way you don’t have to repeat the long drive and you have the opportunity to do even more exploring! The closest town to the Hoh Rainforest is Forks (which is 10 miles north of the turnoff to Upper Hoh Valley Road if you’re coming from the south). You’ll turn east (right if you’re coming from the south) and the parking area, campground, visitor center and trailhead are about 18 miles from Highway 101. The awesome thing about the Hoh is it’s a great destination any time of year! Occasionally downed trees after storms close the road temporarily, but generally the road, trailhead and campground are open all year. July and August are the least rainy but it still could rain and it will definitely be much more crowded. This is a terrific destination for spring and fall and even for winter (check the road status before you go). Make sure to be prepared for lots of rain any time of year. Camping can be frustrating in Olympic National Park as most of the campgrounds are not reservable and fill up in summer. I have spent more than one night driving around looking for a place to camp before ultimately sleeping in my car, so if you want to camp, flexibility is key. If it’s July or August, try to visit midweek to improve your chances of getting a site. If possible, plan your visit in the shoulder season when there are fewer visitors and you can more easily get a site. The Hoh Campground is $20 a night and has lots of sites (but still fills up in summer). There are several campgrounds (not operated by NPS) along the Upper Hoh Valley road (the road to the visitor center and trailhead) as well. Another strategy would be to reserve a site at either Kalaloch campground or Sol Duc Campground. Each is about an hour away, but you can reserve them (make sure to reserve very early). Kalaloch is a beautiful campground right on the ocean with a dog friendly beach (most locations in Olympic National Park, including the trails in the Hoh do not allow dogs) and Sol Duc is at Sol Duc Hot Springs, perfect for a post hike soak! If you’re not interested in camping, or it sounds like too much of a hassle, then there are plenty of lodging options near Forks. You can find vacation rentals as well as a number of motels. Food options are not terrific in Forks, I would recommend the excellent River’s Edge Restaurant in La Push (about a half hour drive from Forks), which has delicious food as well as a gorgeous view of the water. If you decide you’d rather cook for yourself, check out the Olympic Suites Inn, which has kitchens! The Dew Drop Inn is another great place I’ve stayed in Forks, it has spacious and clean rooms and helpful staff. I’m not sponsored by or affiliated with any of these locations, I just think they are excellent! When you arrive in the parking area, make sure to take a few minutes to check out the visitor center, which teaches you about the ecosystem and flora and fauna of the Hoh. It’s only open daily in the summer, so in the shoulder season it may be closed if you visit on a weekday (it also usually closes completely for a couple of months in the winter). Year round you can get wilderness permits for overnight hikes here. Ranger led programs are also offered in the summer. The most important thing to do in the Hoh is to get out and experience this unique forest environment. Try to give yourself enough time to be present, to walk slowly, and perhaps even spend a few minutes just looking up at the height of the ancient trees and taking some deep breaths. You can read all about the health benefits of this practice here. Make sure to look up as well as down, the understory of ferns and mosses is just as impressive as the canopy overhead. Don’t forget to look at the understory plants as well as the tall trees above! There are two short nature trails, the Hall of Mosses and the Spruce Trail, and then the much longer Hoh River Trail, which goes all the way to the Blue Glacier on Mt Olympus! 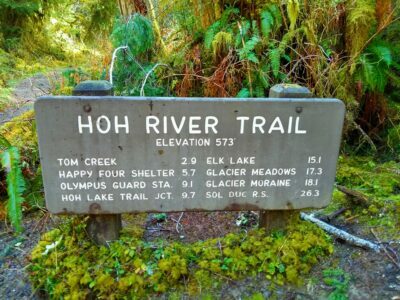 This is an 18 mile one way multi-day adventure, but you can walk any distance on this trail and feel what the Hoh is all about. I recommend a six mile round trip (turning around at Tom Creek) or if you’re feeling more ambitious, a ten mile round trip, turning around at Five mile island. Even going just a mile up this river trail will be unforgettable. This trail goes up and down slightly, but gains very little elevation until much further than you would go in a day trip. At times it is along the Hoh River, at other times the river is not visible but it’s always heard. Whenever you’re ready to turn around, return the way you came back to the visitor center an parking lot. Here is a map of the area around the visitor center, including the nature trails and beginning of the Hoh River Trail. Rain gear! It’s important to have at a minimum a good rainjacket (this is my rainjacket and favorite for rainy hikes) and good waterproof boots. Consider wearing rubber boots instead of hiking boots, there is epic mud! These are the boots I wear for rainforest muddy hikes, super comfortable to hike in and also super cute! A real camera and tripod: Phone cameras struggle to get good pictures in the rainforest. It’s possible, but for this sort of outing I think it’s worth it to have a point and shoot camera that’s waterproof (if you use a DSLR camera that’s great too…don’t forget your tripod)! I have this one and I love it. The low and filtered light in the forest makes a tripod helpful. I use this little lightweight tripod with my point and shoot camera and it has mostly eliminated any blurry low light photos! This post contains an affiliate link to Amazon, which means if you make a purchase I receive a small commission at no cost to you. Thanks for your support! Jennie Thwing Flaming, Chief Adventure Officer: Jennie's life has been a continual quest for adventure (of the non-adrenalin inducing kind) from birth till now. Professionally, she pursues adventures in teaching, counseling and working to obliterate institutional racism for students in our region's public schools and also works as a tour and hiking guide. Previous professional adventures include working in schools in Seattle and Alaska, leading tours and managing tour guides and traveling science shows and lessons with Pacific Science Center. She is working to earn a living outside and by sharing her beautiful and unique Pacific Northwest home with visitors. She likes to be outdoors and spend time with the people she loves. Jennie is born and raised in Seattle and has also lived in Alaska and the Netherlands.